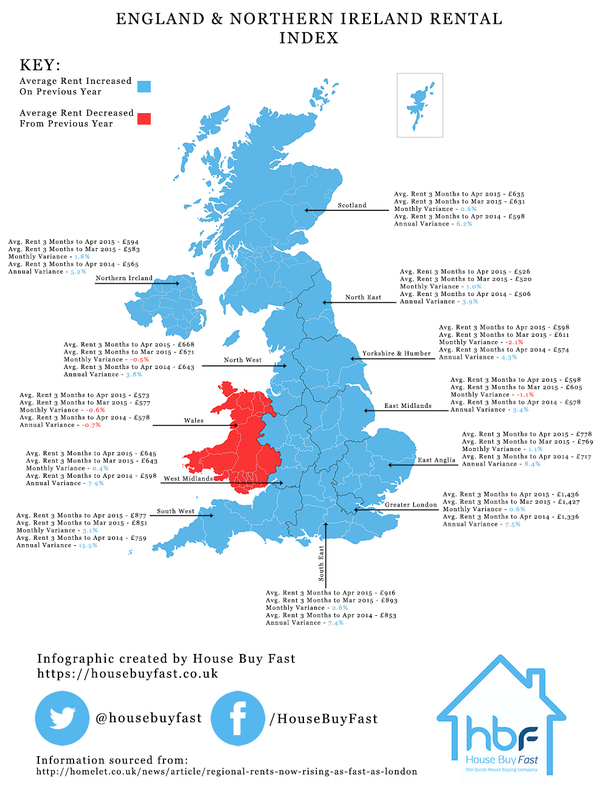 HomeLet have released their Rental Index for Britain and Northern Ireland. Similar to Rightmove's House Price Index, the report covers recent rental increases and decreases. Rents rose across 11 of 12 regions in England, Wales, Scotland and Northern Ireland in the three months leading to April 2015. The new average monthly rent in the UK is now £916. London has the biggest monthly rent price, sitting at £1,436 a month. The South East comes in a close second at £916 a month. The index overall is positive for the rental sector, demonstrating steady growth in 11 out of 12 regions. The North East offers the cheapest rent on average at £526 a month. England, Wales, Scotland and Northern Ireland also saw annual rental prices rise 10%. What's next for rental prices across the UK. Will we see the rising costs trend continue? Will families be priced out of regions such as London and the South East? We would love to hear what you think about the rental situation in the UK. Comment below with your thoughts. Last updated on 08/06/2015 by Jonathan Rolande.